What are home remedies for pinkeye? What kinds of doctors treat pinkeye? What is the prognosis for pinkeye? How can someone prevent the spread of pinkeye? Pinkeye (conjunctivitis) can be due to infectious or noninfectious causes. Infectious pinkeye is highly contagious. Bacterial or viral infections are common causes of infectious pinkeye. Avoiding contact with infected people, disinfection of household surfaces, and good hygienic practices can help prevent the spread of infectious pinkeye. Noninfectious pinkeye can be caused by allergy, chemical irritation, underlying inflammatory diseases, or trauma. Pinkeye is characterized by reddening of the conjunctiva of the eyes, discharge from the eyes, and can be accompanied by other signs of infection like sinus congestion and runny nose. Pinkeye, or conjunctivitis, is inflammation of the membranes (conjunctiva) covering the white parts of the eyes and the membranes on the inner part of the eyelids. These membranes react to a wide range of bacteria, viruses, allergy-provoking agents, irritants, and toxic agents, as well as to underlying diseases within the body. Viral and bacterial forms of conjunctivitis are common in childhood, but they occur in adults as well. Pinkeye can occur in people of any age. Overall, however, there are many causes of pinkeye. These can be classified as either infectious or noninfectious. Pinkeye does not cause any changes in vision. The leading cause of a red, inflamed eye is viral infection. Adenoviruses are the type of virus that is most commonly responsible for the infection. 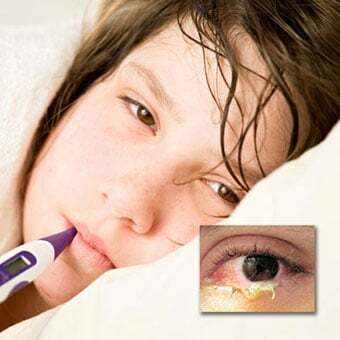 Other viruses that can cause pinkeye include herpes simplex virus (HSV), varicella-zoster virus (VZV), poxvirus (molluscum contagiosum, vaccinia), picornavirus (enterovirus 70, Coxsackie A24), and human immunodeficiency virus (HIV). Viral pinkeye symptoms are usually associated with more of a watery discharge from the eye that is not green or yellow in color. The discharge may resemble an increase in tears or watery eyes. 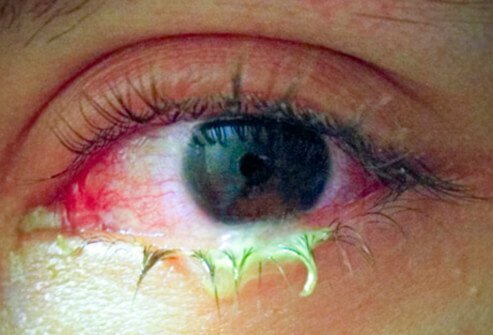 Viral pinkeye is most common in late fall and early spring. Often, viral "cold-like" symptoms, such as sinus congestion and runny nose, are also present. The eyelids may be swollen or puffy and the inner eyelids reddened. Sometimes looking at bright lights is painful so that the individual experiences sensitivity to light. While viral pinkeye may not require an antibiotic, those affected should see a doctor, as occasionally this form of pinkeye can be associated with infection of the cornea (the clear portion of the front of the eyeball). This infection must be correctly detected and treated. Viral pinkeye is highly contagious and typically remains contagious for 10 to 12 days after the onset of symptoms. The symptoms of viral pinkeye can last one to two weeks. Symptoms are pronounced for the first three to five days after symptoms appear, with slow resolution over the following one to two weeks. swelling of the lymph nodes in front of the ears. The discharge commonly accumulates after sleeping. Affected children may awaken with crusty eyelashes most unhappy that their "eyes are stuck shut," requiring a warm washcloth applied to the eyes to remove the discharge. Bacterial conjunctivitis is treated by repeated warm washcloths applied to the eyes (try applying these to a child's eye one eye at a time during a favorite video) and requires antibiotic eyedrops or ointment prescribed by the doctor. Be careful not to use medication prescribed for someone else, or from an old infection, as these may be inappropriate for the current infection or may have been contaminated from other infections by accidentally touching the medicine bottle to infected areas. A safe, effective, and potentially less frightening method of putting drops into the eyes of children involves asking the child to lie down flat, with instructions to merely "close your eyes," and placing the recommended number of drops in the inner corner of the eye, next to the bridge of the nose, and letting them make a little "lake" there. When the child relaxes and opens the eyes, the medicine will flow gently into the infected mucous membranes without the need to "force open" the eyes. When someone thinks he (or she) has bacterial conjunctivitis (bacterial pinkeye), it is very important to see a doctor immediately for several reasons. First, if the cause is a bacterial infection, an antibiotic will be needed to help the infection-fighting immune system to kill this infection. Types of topical ophthalmic (eye drops) antibiotics often used for pinkeye include besifloxacin (Besivance), gatifloxacin (Zymaxid), levofloxacin (Levaquin, Quixin, Iquix), moxifloxacin (Moxeza, Vigamox), tobramycin (Tobrex), ciprofloxacin (Ciloxan), erythromycin (Ilotycin), and others. 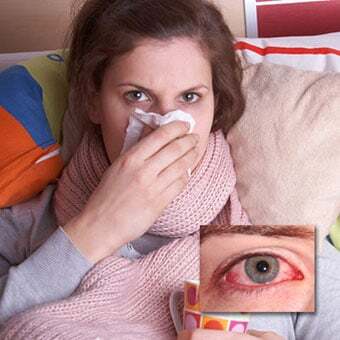 Secondly, if someone is experiencing other symptoms such as a runny nose, cough, earache, etc., there is a good chance that these symptoms are caused by the same bacteria, and an oral antibiotic may also be needed to treat this infection along with the antibiotic eye drops or ointment for the eyes. Oral antibiotics are also required for some types of bacterial pinkeye. Finally, a doctor will want to exclude the possibility that the infection has spread to areas where the symptoms may not yet be recognizable. Pinkeye due to infection with chlamydia is an uncommon form of bacterial pinkeye in the U.S., but it is very common in Africa and Middle Eastern countries. 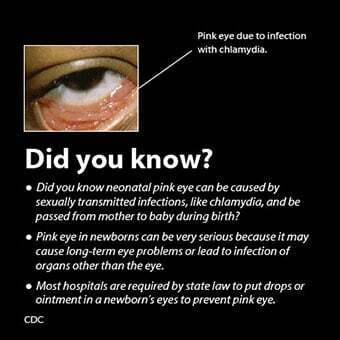 Chlamydia can cause pinkeye in adults and babies. It is a cause of pinkeye in adolescents and adults that can be sexually transmitted. Chlamydia pinkeye is typically treated with erythromycin (E-Mycin, Eryc, Ery-Tab, PCE, Pediazole, Ilosone) or oral tetracycline (Sumycin), except in children less than 8 years of age, because of possible discoloration of the teeth. 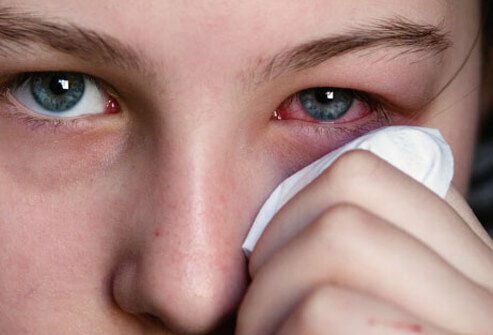 Allergic conjunctivitis symptoms and signs are usually accompanied by intense itching, tearing, and swelling of the eye membranes. 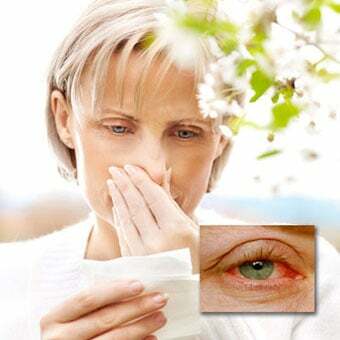 Eye pain is minimal or absent with allergic conjunctivitis. Frequent causes include seasonal pollens, animal dander, and dust. It is frequently seasonal and accompanied by other typical allergy symptoms such as sneezing, itchy nose, or scratchy throat. Moist, cold compresses applied to the eyes and over-the-counter (OTC) decongestant eyedrops can provide relief. Avoiding exposure to the allergen particle that leads to the allergic reaction is most helpful. A doctor can prescribe stronger medications if these home remedies are not adequate. Prompt, thorough washing of the eyes with very large amounts of water is very important if an irritating substance enters the eye. A doctor or local poison-control center should be contacted at once, even if the irritant or chemical is thought to be safe, as some of the most common household products like bleach and furniture polish can be very damaging. Persistent pinkeye (conjunctivitis) can be a sign of an underlying illness in the body. Most often these are rheumatic diseases, such as rheumatoid arthritis, reactive arthritis, and systemic lupus erythematosus. 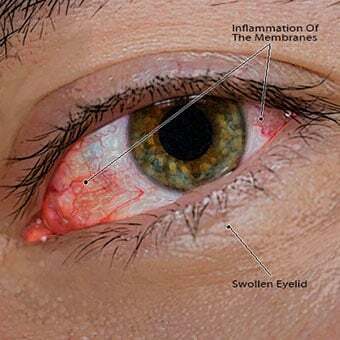 Conjunctivitis is also seen in Kawasaki's disease (a rare disease associated with fever in infants and young children) and certain inflammatory bowel diseases such as ulcerative colitis and Crohn's disease. Bright redness of the whites of the eyes can also occur when the tiny blood vessels covering the whites of the eyes rupture from trauma or changes in pressure within the head (for example, after forceful laughing or vomiting, when diving under water, or even bending upside down). While it is similar, this condition is called subconjunctival hemorrhage, and while it can appear frightening, it is generally harmless. This condition is different from the inflammation of the conjunctiva seen with pinkeye. It causes a local area of the white portion of the eye (the sclera) to become brilliantly reddened. It does not typically involve the colored portion of the eye (the iris) and does not affect vision. 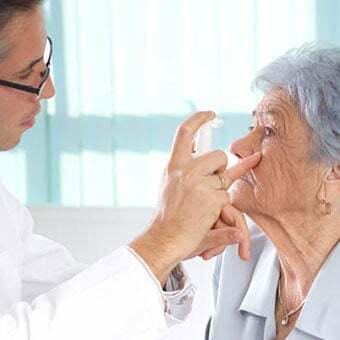 Home treatment for pinkeye should not be a substitute for seeking the advice of a health care professional, and it is important to take all medications as prescribed and to follow a health care professional's instructions for managing the condition. However, there are home remedies to help relieve the symptoms of pinkeye. Moist warm compresses applied to the eyes can help relieve symptoms. OTC treatments like artificial tears (eyedrops) can also bring relief. Do not wear contact lenses until the pinkeye has resolved. A health care professional can offer guidance about when it is safe to resume the use of contact lenses. Eye makeup and cosmetic creams should also be avoided in the eye area until the symptoms and signs have resolved. Pinkeye is often treated by primary care physicians, including pediatricians and family practitioners. An eye doctor (ophthalmologist) may also treat pinkeye. Sometimes people may seek care for pinkeye at an urgent care center and may be treated by a specialist in emergency medicine. Most uncomplicated cases of pinkeye heal completely without long-term complications. Pinkeye that is related to underlying diseases may recur over time. Some serious infections of the eye may lead to vision loss when not treated properly, so it is important to seek care for severe or persistent pinkeye, or pinkeye that is associated with decreased vision. Infectious forms of pinkeye are highly contagious and are spread by direct contact with infected people. If someone has infectious pinkeye, avoid touching the eye area and wash the hands frequently, particularly after applying medications to the eye area. Never share towels or handkerchiefs, and throw away tissues after each use. Disinfecting surfaces like countertops, sinks, and doorknobs can also help prevent the spread of infectious pinkeye. Boyd, Kierstan. "Conjunctivitis: What Is Pink Eye?" American Academy of Ophthalmology. Mar. 1, 2017. Yeung, Karen K. "Bacterial Conjunctivitis (Pink Eye)." Medscape.com. Oct. 5, 2017. <http://emedicine.medscape.com/article/1191730-overview>. Coxsackieviruses may be divided into two groups. Type A causes hand, foot, and mouth disease and conjunctivitis, while type B causes pleurodynia. Both types sometimes cause meningitis, myocarditis, and pericarditis. There is no specific treatment for this disease. A subconjunctival hemorrhage is bleeding under the eye's conjunctiva. 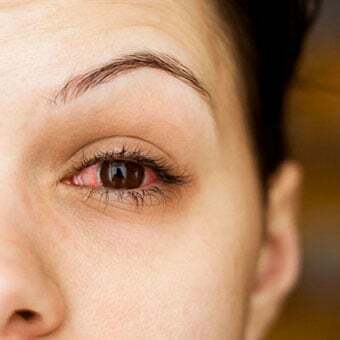 There is usually no obvious cause for a subconjunctival hemorrhage, but it may be caused by sneezing, vomiting, infections on the outside of the eye, coughing, and clotting disorders. Symptoms and signs include blood in the white of the eye and a sense of fullness under the lid. No treatment is needed. Ulcerative colitis is a chronic inflammation of the colon. Symptoms include abdominal pain, diarrhea, and rectal bleeding. Ulcerative colitis is closely related to Crohn's disease, and together they are referred to as inflammatory bowel disease. Treatment depends upon the type of ulcerative colitis diagnosed.